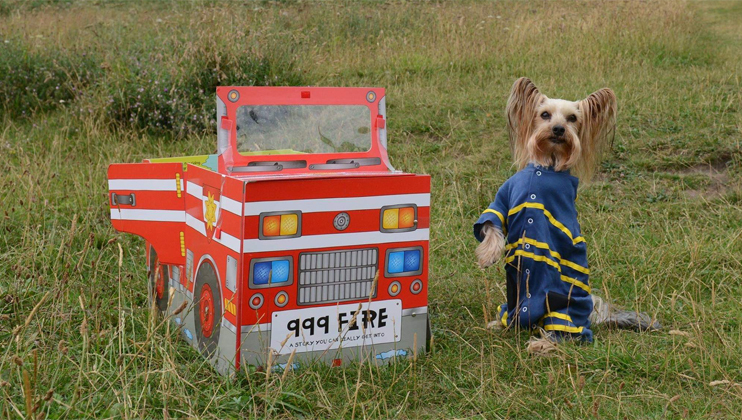 A three-legged Yorkshire Terrier with its own Twitter account is the star of a calendar raising money for The Fire Fighters Charity. Mr Pelucchi – pronounced Pelookey, which means ‘blanket fluff’ in Italian – has joined forces with the Tyne and Wear Fire and Rescue Service to raise funds for the Charity. Ensuring Mr Pelucchi reaches all his various public appearances is his ‘personal assistant’, owner Zoe Carpentier. She has been sharing photos of her dog on Twitter since adopting him, but it was the photo of Mr Pelucchi in a firefighters costume playing with her garden hose where Zoe’s involvement with the fire service began. The photos Zoe took of Pelucchi enjoying his tour and training drills gave her an idea of how to say thank you. She decided to turn to approach the Royal Berkshire Fire and Rescue Service about the possibility of producing a calendar, with funds going towards buying special oxygen masks for animals involved in fires. Funds from the calendar raised enough money to buy 21 pet oxygen masks, so Zoe wanted to do more. The more time she spent with the firefighters, the more she realised how little she knew about their daily life. So in 2018, she created a second calendar, this time taking photographs of Pelucchi in a series of firefighter-in-training shots, covering everything from cable entanglement to water rescue. It's time to open up your Barkshire Firefighter in Training Calendar! The 200 calendars she sold that year raised enough to buy an extra 29 masks, this time for Oxfordshire, Buckinhamshire and Hertfordshire, as well as funding a CPR dog mannequin for Royal Berkshire. Having a family connection to Newcastle, she decided this year’s funds would go towards Tyne and Wear. She suggested the animal masks, but the fire and rescue service instead suggested The Fire Fighters Charity.